Hope all the american readers (and whoever else celebrated) had a good turkey day. In the spirit of thanksgiving (and also because I’m with my family and want to make this a short post) I’m going to enumerate some things we as blood DKs should be thankful for as we move into WoD raiding. I’ll make a nice big post to compensate for this short one after the holidays. 1. They haven’t nerfed Blood Boil (yet). Currently Blood Boil is giving us amazing AoE potential, as well as good single target damage when we can spam BB. This may get nerfed, and if they do they NEED to compensate our single target damage, but for now Blood Boil and be merry. For those of you who followed Blood through the WoD alpha/beta, one of the biggest concerns throughout was our downtime, and it isn’t an issue at all thanks to changes made towards the end of the beta. Whether or not you are a fan of the new iteration of Blood DK, it could easily be a lot worse with tons of downtime. No more having to worry about standing in fire to be optimal! This also makes tank damage balance much easier to tune. AP is one of the most important variables when looking at ability damage, and a wide range of AP coefficients mixed with a wide range of AP values (from 50k AP to 1m+ AP) made balance between tanks an absolute nightmare. With the possible exception of Multistrike (more on that in a future blog post) all our stats have tangible offensive and defensive value. This is a huge improvement over MoP, where mastery and stamina were our best survival stats, but did absolutely nothing for damage. Blood DK is in an ok spot right now. We are not top dog, but we are certainly not a runt. Many people have read around the web and even my own guides that Blood Tap is currently the best thing in the world for blood dk. They’ve also heard for years about how Runic Empowerment is the bane of your existence and shouldn’t be touched with a 10 foot pole. In this post we’ll be looking at if those commonly conceptions are founded in fact (spoiler alert: they are). Before we start, I’m going to introduce a common way of describing runes. It’s simply: BBFFUU. In this format, Xs are recharging runes. So if you used a Blood Boil and a Death Strike after having all your runes up, you would have BxFxUx, since you’d have 1 of each rune recharging. If you then used another Blood Boil followed by a Defile, you would have used another B and U runes, creating the rune state: xxFxxx. ezpz. So why is Runic Empowerment (RE) so terribad? It simply comes down to consistency being more valuable than overall throughput. For those of you who don’t hang around math nerds or engineers, throughput just means how much you are accomplishing over a given time. In this case, Runes. It’s a classic case of more is not always better. The very brief version for why RE is bad, is that it requires us to put all our runes down to get any benefit back. Runic Corruption and Blood Tap both let us hang on to our current runes while we work towards the benefit of new runes. This is because RE only works on fully depleted runes. Using the rune display format I showed in the intro, a fully depleted rune is a rune with both x’s, in other words both are recharging. In the state: BxFxUx, no runes are fully depleted, even though there is a rune recharging of each kind. However the state xxFxUx has its blood runes fully depleted, since both are recharging (thy are both x). RE requiring fully depleted runes back means that if you want to spend RP (which we do very very often) and want that RP to go to something like Death Strike (which we do very very often), you need to make your F and U runes fully depleted while leaving your B runes not fully depleted so that it’s guaranteed to hit an F or U rune, whichever you happen to need. That means getting into a rune state of xBxxxx. That way your first proc of RE will get you either xBxFxx or xBxxxU, and the following proc guaranteed to get xBxFxU. So what’s wrong with that? Notice how the first 2 states are completely useless in respect to Death Strike, which needs an F and a U rune to be used. Also keep in mind that RE is a % to proc, meaning you have a chance to be left with either of those first 2 useless states where you can’t Death Strike if you need to, which is a dangerous position to be in. Let’s take a look at the chances of being left in these positions after fully depleting your runes. So lets look at the chances of getting a DS back after putting all your FU runes down to make them fully depleted. Remember this has to happen every time you want to dump RP. At 0 seconds you put your runes down and are now in a xBxxxx state. 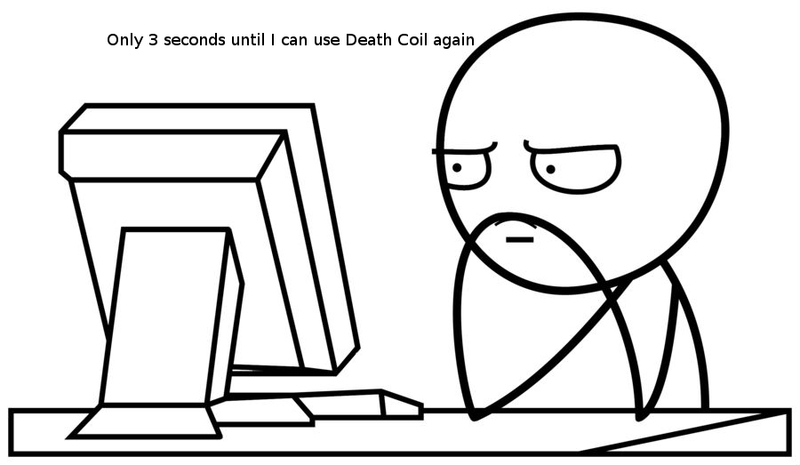 1 second later you will have done 1 Death Coil, meaning a 45% at a depleted rune coming back. This means that since second 0 you have a 0% chance of having a DS and a 100% chance of not having a DS at this moment (1 second). At 2 seconds you will have done 2 Death Coils. 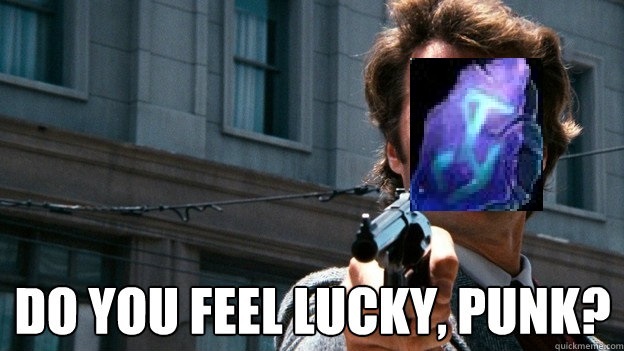 You will only have Death Strike available if you land both procs, so you have a chance of having a Death Strike available 2 seconds and 60 RP since you depleted your runes. After 3 seconds, you are still more likely to be left without a Death Strike. This is not good for Death Strike timing. After 3 seconds you will very likely need to use your blood rune to have enough RP for a 4th Death Coil, which means the 4th Death Coil will likely happen at 5 seconds. This is simply way to long to be potentially left without a FU pair. So we’ve determined that you will spend around 3-5+ seconds after you put your runes down to get your Death Strike back, which is 3-5+ seconds where you simply cannot react to damage with a Death Strike. That’s not good, regardless of how much more rune throughput you have compared to the other two talent options. remember you have to take this gamble every single time you want to dump runic power, which happens a LOT. Keep in mind the other 2 options have no such mandatory downtime. This alone completely nullifies Runic Empowerment as a good option for Blood tanking whenever Death Strike timing is an an important factor. Blood Tap is listed in nearly every guide on the internet for blood as being the best talent. Why is that? While the ability to control exactly when you get your runes back is very good, the real reason behind blood tap’s strength is the fact that it always returns Death runes. Being able to turn Blood runes into Death Strikes is very powerful in regards to mitigation, and being able to turn F and U runes into D runes when they would otherwise come back as F or U is a huge dps benefit in AoE situations due to Blood Boil. Essentially Blood Tap makes all your runes into very flexible resources, as opposed to the normal segregation of B runes for Blood Boil/Soul Reaper and F and U runes for Death Strike. One of the benefits of this Death rune flexibility is when we use a U rune on Defile, potentially leaving us with something like a xBxFxx rune state, where we have an unusable F rune. Being able to use 5 charges to get a guaranteed D rune means that the orphaned F rune is easily turned into an F D pair for use as Death Strike. Another benefit to this flexibility is being able to always get a D rune for Rune Tap or Soul Reaper as long you have at least 5 charges of BT. On top of the flexibility is the ability to conserve charges for large hit mechanics. You can save 10 charges and both FU pairs, use both FU pairs then use 10 charges for a third to get 3 Death Strikes in 3 seconds to put in front of a huge hit. No other talent option can do this. “Consistency is contrary to nature, contrary to life. Well since I’ve yet to see a Death Knight that didn’t start out by being raised from the dead in Acherus by the Lich King at lvl 55, I can safely assume none of us are living. That means according to our friend Huxley, consistency is good for us! Consistency is one Runic Corruptions greatest assets. It doesn’t have the aoe damage potential of Blood Tap, nor the Death Strike flexibility of Blood Tap, but it has beautifully consistent and fluid rune return. Consistency is one of the most important aspects of tanking in general. For example, it’s better to take slightly more damage overall if you always take it a little bit at a time instead of taking very little normally but occasionally taking huge amounts of damage. This is one reason why Blood DK has always been concerned with removing burst damage and mitigating spikes, because those are our biggest threats. It’s the basis behind a LOT of our playstyle, like the idea of spreading out cooldowns as opposed to stacking them. Or holding on to Death Strikes to make sure we can recover from bursts immediately. Long story short: Consistency = very good. Because fluid rune return doesn’t always translate to consistent damage intake. Due to the nature of it being optimal to sit on FU pairs for recovery Death Strikes, rune return isn’t always an immediate benefit to our damage intake pattern. More runes is never a bad thing, and if you are able to get FU pairs back faster consistently, you are able to lower your standard for “burst” and make yourself even smoother, however Blood Tap does this even better due to the RNG-less return as well as the increased DS/min (which is rarely a good metric for measuring effectiveness btw. please don’t take this out of context.) in comparison to Runic Corruption. That’s before you even take into account the complete superiority of Blood Tap in regards to damage output in AoE situations thanks to more Blood Boil spam potential, and even the quality of life benefits of being able to free orphaned runes and always have a rune for Soul Reaper/Rune Tap. There are some situations where RC is better, however only one is common. That situation being when you are not able to use your Blood Tap charges effectively due to not being comfortable with the mechanics. Blood Tap is only better if you can actually use the charges. If you are wasting charges by using Death Coil at 12 charges, or using your charges but having rune recharge being wasted by having both of one kind of rune up a lot, then you are going to get more value out of the much smoother and easier to use Runic Corruption. Not exactly. 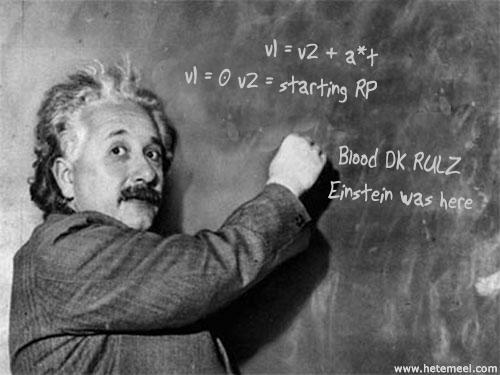 I’m saying you should use RC if you are still familiarizing yourself to the basics of Blood DK gameplay. It’s better to use RC until you are comfortable enough with everything else that you can learn to use Blood Tap well. 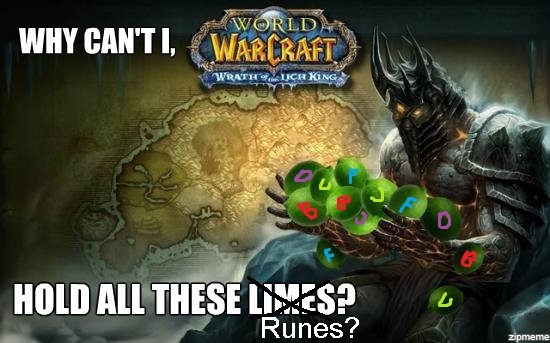 There is a lot to learn for incoming Blood DK. It’s probably the tank that requires the most flight hours to play well, since so much of good Death Strike timing is simply practice and experience. There is 0 shame in spreading out the things you have to learn. If you feel you that using RC makes it easier for you to work on the other more important factors of DK tanking (aggro, cooldowns, boss movement, fight mechanics) then I would highly encourage you to do so. Blood Tap is the best, Runic Empowerment needs to be taken out back and put down, and Runic Corruption is good for learning purposes. The information found here regarding Breath of Sindragosa and Defile is outdated. Please refer to the newer post regarding that information. With the new expansion comes new shinies. In this the first “real” post of this blog, let’s dive in and take a deep look at each option. While you COULD just use simcraft to find the damage output differences, I prefer to do my theorycrafting on paper. Plus who doesn’t love math? It is important to remember however that doing this gives us a THEORETICAL model of these talents. You have to adjust the conditions around these models to get any practical information. The first step to comparing damage without simulating it, is to model each of the talents mathematically. This means making a formulaic representation of the abilities damage. For example: if you wanted to mathematically model the damage per second of a dot that ticked once every 3 seconds for 50% AP each tick, it would look something like this: DPS = (damage)*(ticks per second), which is basically saying “how often and for how much”. Plugging in our given values (50% AP every 3 seconds) and we get DPS = (.5*AP)*(1/3) = 1/6*AP, or 16.67% AP per second. If you had 7,000 attack power, this dot would have a base DPS (so not including anything like +% dmg modifiers or other boss mechanics) of 1166.67 DPS. Now that we’ve established what a formulaic model LOOKS like, we need to go about making one that works for the lvl 100 talent options. In the example above we only looked at single target damage. For a real comparison we’re going to have to account for the number of enemies (and a bunch of other talent specific stuff), which means our final comparison will be in terms of both AP and the number of mobs we are attacking, and stuff like how often you use Blood Boil, and all sorts of goodies. With the intro out of the way, let’s start modeling! Breath of Sindragosa is by far the easiest to figure out conceptually speaking. The damage formula for it is as follows: AP on the primary target, and AP/n for all secondary targets where n is the total number of targets, primary included. For example, if you had 3000 AP (and no versatility or other +dmg% modifiers) and used BoS to hit 5 targets, the first target would take 3000 damage. 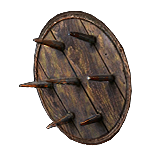 The other 4 targets would take 1/5*3000 = 600 damage each. This means that the total damage of a tick of Breath of Sindragosa is equal to AP+(AP/n)*(n-1). Finally we will need to account for the RP spent in terms of potential Death Coils. BoS damage isn’t free. Every tick of BoS is worth 15 RP, which is half a Death Coil. This means that per tick, we subtract half a Death Coil (which is .85*AP/2 = .425*AP) from every tick. From here, calculating the time until 15 stacks is just like figuring out how long it will take a car to reach 60 miles an hour. The base “acceleration” of NP is one tick (which grows it 1 stack) per 2 seconds. In other words, 0.5 stacks per second. We simply add the stacks/sec acceleration given by the BB/sec model we have above, and we get an acceleration of 0.5+$BB per second. Now that we have a way to model the growth of NP as a function of haste and multistrike, we can start to piece together the total damage. First let’s break the growth into 2 parts: the rise to 15 stacks and the total time in 15 stacks. These together will add up to 30 seconds (NPs total duration) so we can put it in an equation like this: (growth time + max stack time) = 30. We can find the growth time by an old-fashioned physics equation. v2=v1+a*t, where v2 is our desired velocity (or in our case stack count) v1 is starting velocity (in our case, 1 stacks) and a is our growth (0.5+$BB) and t is what we want to solve for. t = 14/(.5+$BB). This means we can find the time that NP is at max stacks by taking 30 – 14/(.5+$BB). Let’s solve the easy part first, the max stack damage. All we need to do is find the number of ticks we get at 15 stacks. We already know the average time in seconds NP will be at 15 stacks (30-14/(.5+$BB)), and we know NP ticks every 2 seconds. Therefore the total tick count at 15 stacks is equal to 15-14/(2*(.5+$BB)). Now we’ve spent quite a lot of time looking at variables. Sometimes it’s nice to come up for air and check to make sure our numbers are realistic. Given my current stats (518 haste and 21.56% multistrike raid buffed) we can figure out using our math above that my theoretical max BB/second is 0.34895, in other words I’m blood boiling an average of once every ~3 seconds. It’s important to remember that this is an average. You will have much high BB/sec if you pop ERW after expending all your runes on BB for a total of 8 BB each 1 GCD apart, but you would also then have a very large downtime of no BB due to no runes. With my average BB/sec, it would take me about 17.67 seconds to reach 15 stacks if I were spamming BB. This is about what we’d expect given that if you used no Blood Boils at all it would take you the full 30 seconds to reach 15 stacks on the final tick. Alright let’s take some inventory. 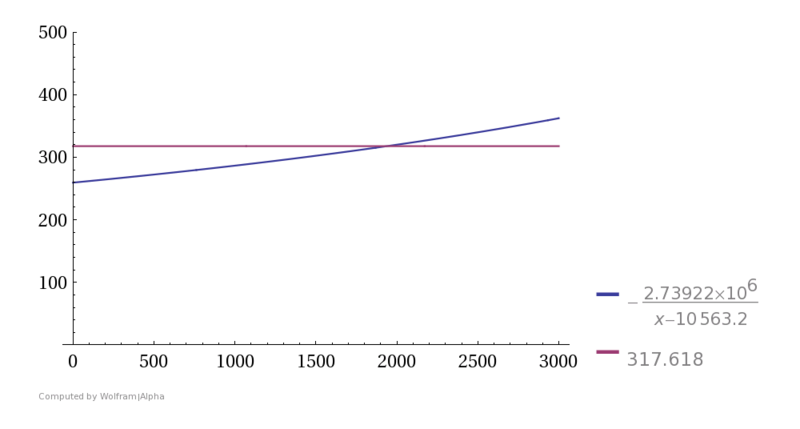 We have figured out the theoretical maximum Blood Boils per second as a function of haste and multistrike. Then using that, we found the model for how many ticks we have at full strength (15 stacks) and how many we have leading up to full strength. We know how many ticks it will take to reach 15 stacks (14/(.5+$BB))/2), We know how fast the stacks grow, and we know how much damage NP will do at a given stack value. The way we are going to model this looks like this: tick1+tick2+tick3+….tickn, where n is the number of ticks that occur at <15 stacks. So for example let’s say that you managed to use Blood Boil every 2 seconds (to make the math cleaner). Tick1 would be at 1 stack, tick2 at 3 stacks, tick3 at 5 stacks…..tick 8 finally hits 15 stacks, so n was 7 because the 8th stack was at full strength. If you’ve taken any math at a pre-calculus level or above (and remembers it) you should be familiar with the ∑ symbol. It represents a summation operation. 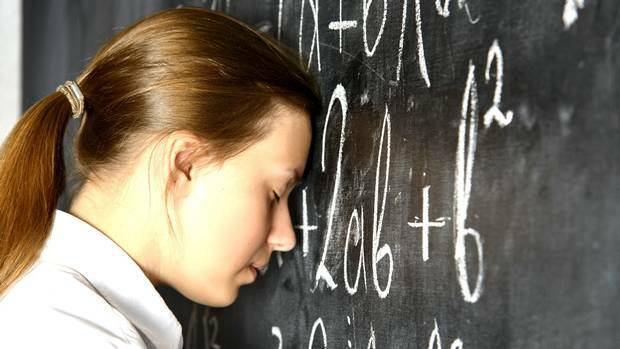 So the sum from i=1 to 5 of the function i would be: 1+2+3+4+5. We are going to use a summation to model the ticks <15 stacks, but what do we sum from? And how far do we go? Well we’d like to sum from 1 (1 stack) to our tick count (14/(.5+$BB))/2), however there is a slight problem. Indexing only uses integers. In other words, it doesn’t make sense to count: first, second, third, third and a half-th(?). When you enumerate items, you can’t have a partial item. The number of ticks we have is a theoretical average, and is not an integer, meaning we have to account for the left over bit somewhere else. In other words, if we would get 8.5 ticks as a theoretical average, then we would sum over 8 ticks and add one more tick worth half of what a normal 9th tick would be. We can do this with the floor function “⌊⌋” in our summation, which will round our tick count down for summation. That is a bit messy, however it is a complete model of the ticking damage for NP. We don’t need this again until we put it all together. There’s one final piece that needs to be considered when looking at NP’s damage, and that is the RP gained when mobs swing at you. Observant readers will notice I added a little note when I showed the BB/sec formula, which means all the work up till now has been including the RP gains from NP. Phew… But we still need to acknowledge the damage of actually spending the RP, not just how that RP affects BB/sec. You get 5 RP whenever you are swung at, and we can assume that a standard mob will swing at you once every 1.5 seconds. This means that for each target you get 10/3 RP per second, or (10/3)*n where n is the number of targets. Death Coil costs 30 RP, so that means you get ((10/3)*n)/30 DC per minute. That’s not the end though, because those Death Coils gave us Blood Tap stacks, which can be used for more runes, which gives us more RP which gives us…. It may sounds like an infinite loop, but I promise it’s not. It diminishes significantly each time. It can be modeled by what’s called a geometric series. The value gets smaller and smaller so quickly, there is a point at which it will never give more than a certain amount of RP. To help visualize this, let’s use the old half-step thought problem. If you were to stand 2 meters away from an object, then half the distance between you and the object every second, how many seconds would it take to reach the object? After the first second you would be 1 meter away, then .5 meters away, then .25 meters, then .125 meters, then .0625 meters… This would go on until the end of time, and you would never reach the object until you reached infinity. To answer the first point, yes. Let’s take a look at it in the form of a geometric sum. Notice how in the graph below, the curve gets more and more horizontal as you get higher and higher, never quite reaching 2 but always getting closer. You can see that as you get closer and closer to infinity, you get closer and closer to 2. 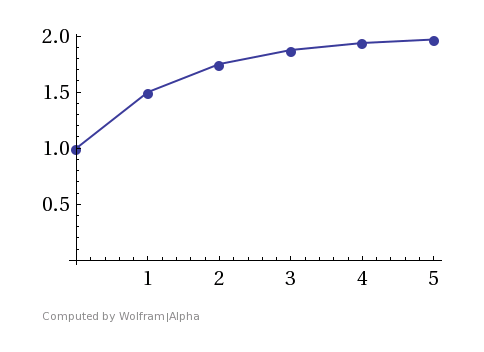 This is called a convergent series, and it means that if you added up ALL points to infinity in that series, you would get a non-infinite value – in this case 2. To answer your second question, we are going to use the same principle to figure out the total gain from an infinite series of turning runes into RP, then turning the RP into Death Coils, then turning those into runes, which turns back into RP, so on so forth. When you spend 30 RP on DC, you get 2 charges of BT. This translates to 40% of a rune. Let’s assume for the sake of comparing damage output that you will use that rune on a Blood Boil. So our first “step” has us getting 1 DC and 40% of a BB. 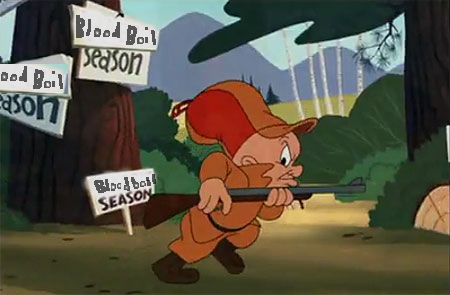 When we spend that BB though, we get 10 RP back, so the next chunk has us getting 40% of 10 RP back to spend on 2/15ths of a Death Coil, so on so forth. Let’s look at it on paper. 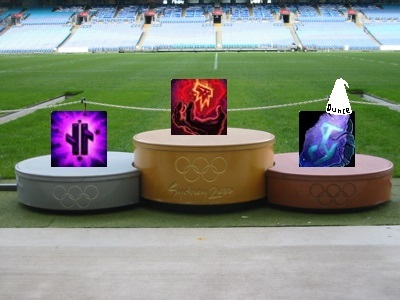 4 RP = 2/15 DC + 4/75BB + 8/15 RP. Can you see the pattern? Rewritten, this is 1 DC + .4*BB + 2/15*(1 DC + .4*BB) + 4/225*(1 DC + .4*BB)+…..
We have a geometric series! YAAAY!!! Just like the distance problem (which is called “Zora’s paradox” btw) from earlier, we can find the value that a certain amount of RP gives us including ALL the infinite returns of RP and runes by finding the sum we just wrote. Turns out it ends up being a very clean (15/13)*x where x is the amount of rp. If you like this kind of math, then you’ll love the blog post that covers how we found the BB/sec formula. Now that we have the total damage, we need to subtract the damage we lose by not having our normal dots. We can’t have both at the same time, so we need to account for their damage when looking at NP. Now we just account for this happening once every 30 seconds, and we get the DPS. This geometric series looks like x + 1.025x + 1.0252*x + 1.0253*x. We already know how to solve geometric series. The only difference is i will go from 0 to 9, representing the 10 ticks of Defile as opposed to from 0 to infinity. This means the total damage for Defile per cast is ∑09(x*1.025i), and on a 30 second timer we can cast it twice a minute, giving us a dps of (1/30)*∑09(x*1.025i) which simplifies to 0.373446*x. Now we just substitute x in for the tick formula for Defile, which is 1+.275*AP and multiply times the number of enemies in the radius of Defile and you get the final DPS of Defile: n*(1/30)*∑09((1+.275*AP)*1.025i) where n is the number of enemies in Defile. Before we’re done however, we have to subtract DnD damage. At the time of this writing, DnD is almost identical in damage to Blood Boil. In fact, the only time DnD does more damage than Blood Boil is if EVERY tick hits the boss. If the boss moves off dnd for even 1 tick you would have done more damage with BB, but for the sake of this model DnD is still the correct ability to subtract for the rune as we are looking at things in a vacuum where we can always assume every tick hits. OOOOKAY. after a TON of math, we now have some math models for each talent choice dependent only on base stats such as AP, haste, and multistrike. As a recap, here are the models. where n is the number of targets hit by the cone. where n is the number of targets in Defile’s radius. In order to compare the models we made, we need to set up some situations. The possible situations are innumerable, and can be as specific as you need for your situation, but there are some default situations that are commonly considered when looking at dps. Those are things like large aoe packs, small aoe packs (like 3-4 mobs), sustained vs burst damage, high stats vs low stats, etc. I will point out that we are currently unable to model sustained vs burst, as all our calculations involved full duration. 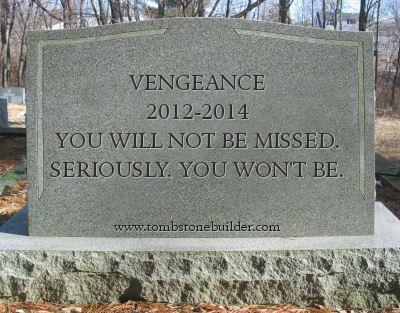 In other words, we are locked into a sustained situation because I have been writing this blog post for 3 days, and am frankly tired of modeling Necrotic Plague. Just know that it’s completely possible using the same techniques displayed in this post. Let’s make 2 simple comparisons: Current gear with high AoE and current gear with 1 target. In order to apply these comparisons, we just set up values for the variables in play. Let’s use my gear (which is currently only 632. The loot gods have not been kind). As of this post I have 518 haste, 533 multistrike with food, and 5122 AP when flasked. 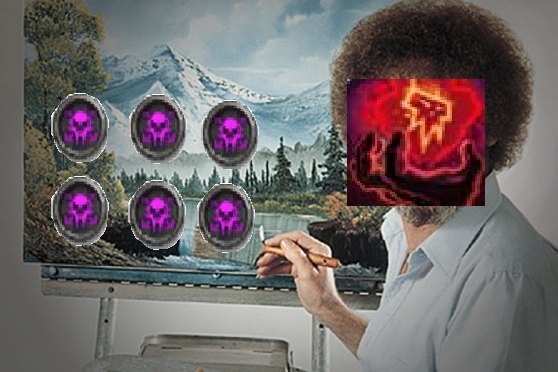 Specifically, let’s find out how many adds it takes for Breath of Sindragosa to do more damage than Defile. The model is going to look like Breath of Sindragosa DPS > Defile DPS, and treating n in both equations as a free variable. 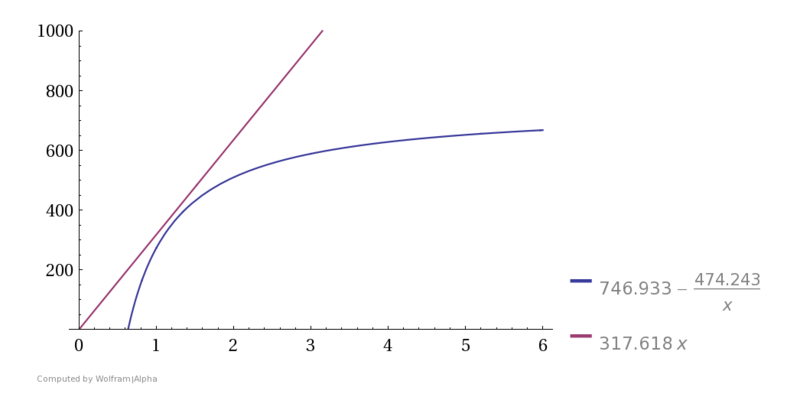 If a value for n greater than 0 exists that satisfies that inequality, then that add count n is the number at which NP will be more sustained DPS versus Defile. then we plot them and compare! Notice how the blue curve (Breath of Sindragosa) never surpasses the red line (Defile). This means that with our given stats, Defile will always do more damage, assuming all hits tick. This is what we would expect, since Defile doesn’t have diminishing returns on AoE and BoS has a steep DR, giving it the curved shape. Defile is ONLY based on AP, while BoS is also based on haste and multistrike. How much haste would you need for BoS to surpass Defile on 1 targets? Again assuming you build to 90 RP before using BoS. We will set up the curves as before, but this time leave haste as an independent variable. Just like before we are looking at the curves and how they interact. Notice how they intersect at around 2000. This means that after than intersection point (which is actually 1938.92 haste rating) then BoS will do more damage single target than Defile. HOWEVER. It is INCREDIBLY important that we keep in mind that this includes our AP sitting at 5122 and not moving an inch. THIS DOES NOT MEAN THAT YOU SHOULD USE BoS. You should still use Defile any time you are not going to be moving the boss often, even if you had an on use haste trinket to reach this value because this is assuming you also get plenty of RP going into BoS which isn’t always reliable. You will also lose damage from using an on use haste trinket compared to a better itemized trinket as haste is not nearly as good for us as strength, bonus armor, crit, or versatility. While Defile is still going to be the talent of choice 90% of the time until they balance the tier, it is still worth knowing how to mathematically model these talents should they become balanced. It’s also a fun way to kick off a blood DK blog! A wild blood DK blog appears! For those who don’t know who I am, my name is Reniat and I have been doing theorycrafting for the blood dk community since shortly before the release of Mists. I have decided to move my theorycrafting base of operations to a blog format. The guide that was previously stickied on MMOC and battle.net will be hosted here (after some formatting for beauty reasons), but I will also be doing blog posts related to blood (and general) tanking. This is very much a work in progress, but I look forward to providing new content on a regular basis!